The challenges of WLAN deployment increase significantly for most educational institutions when they have tight budgets and busy IT staffs for making the transition from wired to wireless. 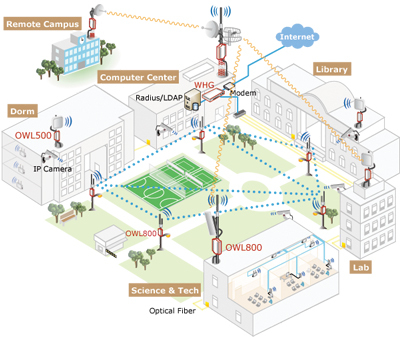 The 4ipnet Wireless Campus Solution – 4ipnet WHG WLAN Controllers operating in conjunction with 4ipnet Access Pointsenables pervasive indoor and outdoor wireless coverage and gives flexible, expandable, controllable and manageable Secure Access Services for the entire campus. It allows all types of authenticated users to connect to campus network or internet resources at chosen times and places. 4ipnet’s solution creates a variety of teaching opportunities in a dynamic “Any Time, Any Place Learning” environment. 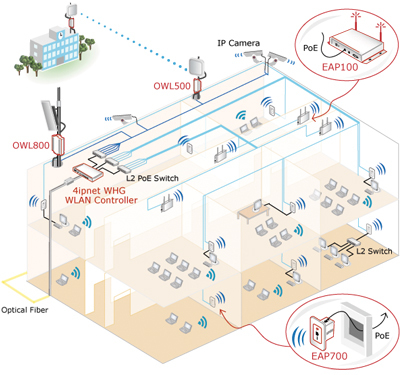 All 4ipnet OWL and EAP outdoor/indoor APs are centrally manageable by 4ipnet WHG WLAN Controllers, allowing the network administrator to gain full control over the entire network infrastructure. 4ipOS* fully-hardened kernel provides multiple configurable operation modes to fulfill the needs of connectivity, stability, flexibility and scalability, bringing the highest service capacity per unit and the smallest footprint for physical network setup in the field. All 4ipnet outdoor AP devices follow industrial standards 802.11-WiFi technologies with the highest industrial-grade IP68 weather-proof outdoor chassis, and can withstand dust, rain, power surge, extreme temperatures, and vibrations for prolonged life-time in rugged environment. And, most indoor AP devices follow industrial-grade IP50 in metal chassis that is dust resistant for longer rugged environmental endurance. Shorten deployment time with easy-to-install/configure/maintain devices and well pre-integrated management platform. Efficient bandwidth delivery on each link where bandwidth management guaranties the performance and quality of services (QoS) to support voice/video/data converge applications. The 4ipnet solution for Campus-WiFi Security supports all 802.11 Wi-Fi standards-based security protections over wireless links by WEP, WPA, WPA2, 802.1X and 802.11i, and TKIP/CCMP/AES encryption over WDS links. With embedded 4ipOS* Zone Firewall and Wireless Firewall, it can filter out unauthorized traffics and un-wanted accessing attempts for a clean cyber space. *4ipOS is the self-owned hardened kernel developed by 4ipnet R&D to support the 100% controlling power over pre-integrated 4ipnet outdoor and indoor Access Points with 4ipnet WHG WLAN Controllers. The built-in features include patent-pending 4ipWES Press-n-Connect for easy AP deployment, multiple levels of QoS, wireless firewall, best-tuned VPN engine, role-based vs. policy-based access control flows, various capabilities for top-layer applications, and compliance with all Wi-Fi security standards.